Preferred Property Maintenance (PPM) is a SoCal full-service commercial property maintenance company located in Irvine, CA. From its origin in 1987, PPM worked diligently to establish excellent service standards that are unequaled in the industry. These service standards clearly set PPM's work ahead of the competition and continue to guide our entire staff today. Servicing Southern California for over 25 years, PPM possesses both the knowledge and expertise to get the job done right in the most timely and efficient manner. PPM specializes in shopping center maintenance as well as industrial park and office building maintenance. All our services provided are offered 24 hours a day, 365 days a year. The convenience and dependability of our 24 hour maintenance is clearly a trusted favorite among our clients. Our quick response times and our staff's willingness to go the extra mile have contributed to PPM's success with countless satisfied customers. 96% of PPM's revenue each year is generated from repeat customers, and 98% of new customers come from referrals of existing PPM clients. Our Purpose: "To enhance the shopping experience of everyone who visits your center"
PPM uses the latest technology to ensure quick and efficient response times, as well as top quality service. Our fleet of fully stocked trucks is equipped with laptops allowing our technicians to receive new service requests and update job statuses in real-time. This allows our office staff to keep our clients informed of job status at all times. We encourage you to experience the difference it makes to work with a company who treats your properties like their own. 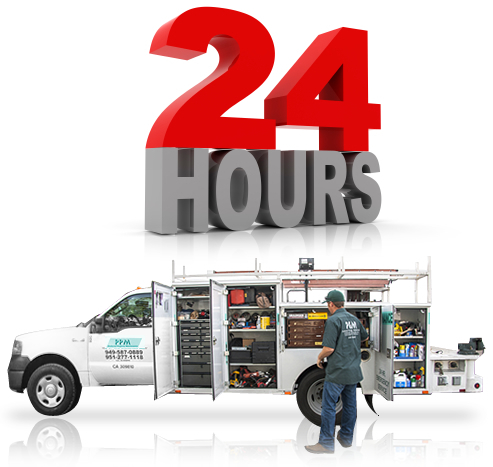 PPM is ready to service your SoCal 24 hour maintenance needs, so feel free to contact us at your convenience. From this site, you can find more information regarding our specific services, Request a Service Call, Request a Proposal, or Contact Us directly. You can also click here to browse an overview of PPM's services.